Pressing onwards with the group painting - laid down the yellow and did some general cleanup of things I've missed on the first pass. My yellow recipe is pretty straightforward, I start off by base coating anything that's intended to be yellow in Hot Orange. Much like the bone in the previous post, the yellow is very translucent, and I find that painting it directly over a black or other dark undercoat it tends to look very patchy. The orange 'shines' through the yellow and gives it a nice warm glow. Once that dried I hit it with a quick drybrush of Fiery Orange - I was in the zone and didn't take a picture of that step though. Once the orange is on, I went in and layered on the Golden Yellow followed by a quick hit of Casadora Yellow wash.
At this stage I discovered a couple things I missed on the bone color step, so I went back and painted in the weapons on the Autarch, as well as the knee and elbow joints on the Wraithblades. I also started blocking in the areas that will end up being leather (boots, pouches, etc.) with Earth Brown. At this point I'm thinking it's time to break the batch painting up into its constituent parts to do the final detailing. Expect more pics of various parts of these guys in a completed state soon! That's my favorite part of painting... when the unit is done enough to wrap up. I'm amazed at your speed and technique. The army is looking great! I can't believe you're burning thru these models so fast! Nice work!!! 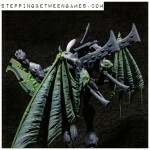 And those wraith dudes are going to look awesome all painted up and vouging with their swords! @Xi: Likewise! Once the heavy lifting is done they just fly to the finish!